While the official features list does not include wireless charging, Verizon claims its LG G2 handsets will offer this exclusive feature. A week ago, when the LG G2 was unveiled, the official list of features did not mention wireless charging at all. 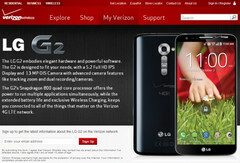 Now, Verizon is getting ready to launch the LG G2 on its network and a sign-up page for those interested is already live. To get updated on the LG G2's release date on Verizon, customers simply need to enter their email address and wait for the good news to arrive. The sign-up page mentioned above also contains a short description highlighting the most important features of LG's flagship phone - the quad-core Snapdragon 800 processor, the impressive 13 MP camera featuring tracking zoom and optical image stabilization, the 5.2-inch Full HD IPS touchscreen and the feature nobody expected to see, "exclusive Wireless Charging". Next to wireless charging, Verizon also mentioned "extended battery life" on the sign-up page, so the LG G2 handsets carried by them may also feature a Silicon-anode Li-ion battery. Alas, we must wait for Verizon's updates for additional information on the capacity of the battery and the release date. Regarding pricing of the LG G2 in the US, nothing is official yet, but the smartphone is already available for preorder in the UK for about $730.